You want to use or configure a certain function in the FRITZ!Box user interface. However, the corresponding settings, for example menu items or buttons, are not displayed although these settings are present in the user interface of a different FRITZ!Box of the same type. 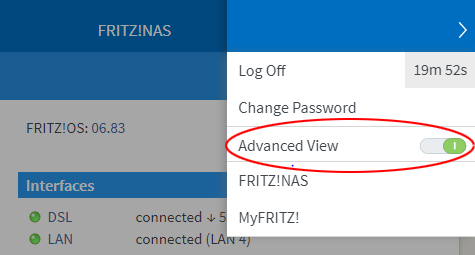 If you received your FRITZ!Box from your internet service provider, the provider hides the "Update" menu because the provider automatically installs the new FRITZ!OS. It is therefore not possible to install an update using the FRITZ!Box user interface. Refer to your provider for information on the new FRITZ!OS version and possible dates. If the FRITZ!Box is configured as a "Mesh Repeater / IP client" under "Internet > Account Information", all of the settings that cannot be used in this operating mode are hidden. This is the case with port sharing, dynamic DNS, IP settings, the online meter, and DSL information. If the upstream router makes these functions available, you can configure them in the router. These settings are only available in the FRITZ!Box if the FRITZ!Box establishes the internet connection, for example when being used as a DSL router.